Organisation is one of the most fundamental skills to possess, not just in the workplace but with day-to day living. With errands to run and work schedules to work out, a simple writing case/folder is all you need to put your thoughts onto paper and declutter your mind. So if you find your office desk somewhat out of control, cluttered with paper and stray bits of information that you may or may not need, find the simple solution with allbranded. Fact is if you struggle with this problem, so will your fellow employees and customers and for a low price you can be the reason why they are able to function more smoothly both at work and at home. If it isn’t organisation you need help with, how about an outlet for your creativity? A word document is rarely a way to trigger the creator within you. The old school pen on paper is far more likely to give way to spontaneous moments of vision that you can immediately put on paper on our highly portable and compact writing folder. Printed writing cases make great corporate gifts! They are elegant, sophisticated and can be given with any important print outs or documents already inside! Stream line your new client signing process with these promotional products and start strengthening relationships from the get go. Spontaneous moments of ideas are uncontrollable, so you are rarely able to choose the time or location of when these hit you. Before you know it, much like the remnants of a dream, these can easily slip away when faced with our daily demands. So why not be prepared? Make sure you are always ready to note your inspiration down and never lose a great idea ever again. If not today, today’s ideas may make sense next week and may very well be a game-changer for your business. How about completing the set and browse through our office accessories; pens, bags, usb-sticks, mugs and sharpeners? The incredibly high usability and visibility makes this a desirable promotional item. Whether you are on a plane, in the office or at work drafting your grocery list; there is never a time where the writing case does not belong. Our beautiful range has branded versions including Swarovski so make use of leather and microfibre for excellent quality and use this as excellent giveaways and incentives for your customers and employers. You should strongly consider ordering some premium prodir pens printed with your logo to go along with your exclusive design writing cases to complete the image! Some coming with handles making it portable by and in itself so why not stop by the coffee shop near your workplace and prepare your day in an organised and laid-back fashion? Prefer to mix and match by making use of both classic writing and technology? 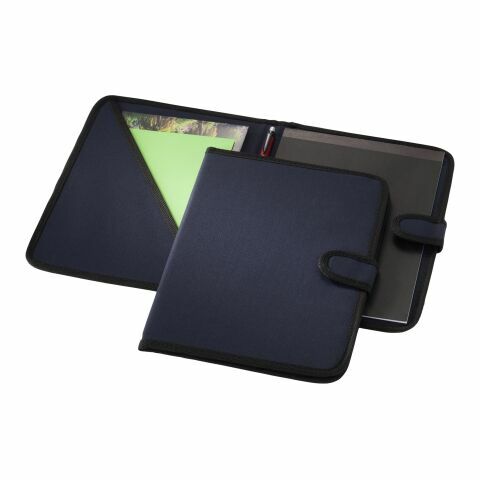 You can always opt for the pad carrier also equipped with a notebook and stationery to get the best of both worlds. Whether you are looking for A4 papers or A5, we stock them all so make these elegant promotional cases your go-to medium to jot down your thoughts will simultaneously representing your brand to the fullest! Attention is the purest form of generosity and this stands true in the business world too. The capturing of it ought not be forced. Why else do we all form a makeshift curve around the street-advertisers willing to engage you into a conversation taking up time that you may not have? We want to give our clients a choice and surely so do you and thus subtlety makes allbranded an advertisement tool that prefers to impress by giving, not pressuring. Yet these items have more than the the two functions; its elegant look means it makes for an excellent workwear accessory. The leather along with the stylish and timeless black means it fits with whatever outfit you choose and won’t have to colour code your day; it is done for you. This is a sophisticated form of advertisement with its elegant look and office-type stationary. Adding your company brand and/or logo allows for the modern look to be associated with your business and reflect pure quality. Have your branding stick every time you pull out your personalised folder and have it be integrated into your everyday life and everyone who associates with you and your customers. In many situations, it is essential to have a pencil and paper handy. No matter whether it is short notes or initial ideas for a new project: together with this writer kit from the allbranded online shop you can now always be on the safe side. Take advantage of the opportunity to say thank you to your loyal customers and business partners and find your brand reflected in every space of daily living. Printed with your company logo or brand these promotional items are gladly accepted and support your target group in managing everyday life and allowing for creative outlet. Each campaign is unique - just like the quality of the products of the allbranded online shops. Good processing and user-friendly handling are especially important to us. For more great branded merchandise please check our printed messenger bagspens, bags, usb-sticks, mugs and custom backpacks? Use our promotional cases to send your advertising message to your customers in style. Choose between different sizes, colors and design; this way your writing case will truly be unique and tailored according to your vision and marketing strategy.